We understand that your organization is unique: Your tool sets and processes are bespoke to your enterprise needs, and your data repositories are many and varied. And because your project managers are busy people and do not always have time for managing tool set implementations, we typically sell a slim layer of consultancy with every Dashworks license. Our Dashworks consultants will help accelerate your IT migration project by leveraging our expert implementation, process guidance, and advice. In the past, we have seen many organizations struggle with questions like "Where do I start now?" or "How do other people do this?" This is why we recommend you take us up on our consultation service and leverage our decade of experience migrating more than seven million assets successfully. The first step is to identify a high-level design for your project. What data feeds are required? Is there any extra data that needs consuming? Where is your data currently held, and who is the repository owner? Next it is onto your project readiness tracking. How many migration paths do you have? Which tollgates would you like to manage and the tasks that reside within them? How are your user or asset groups going to be structured? How many emails do you want to trigger and when? Are you planning self-service and capacity management? Do you want to automate any tasks or trigger deployments? Do you have any bespoke reporting requirements? The answers to these questions enable us to build your implementation statement of work, outlining in a single document exactly how your project is to be built. Now your Juriba consultant can begin the technology implementation process. 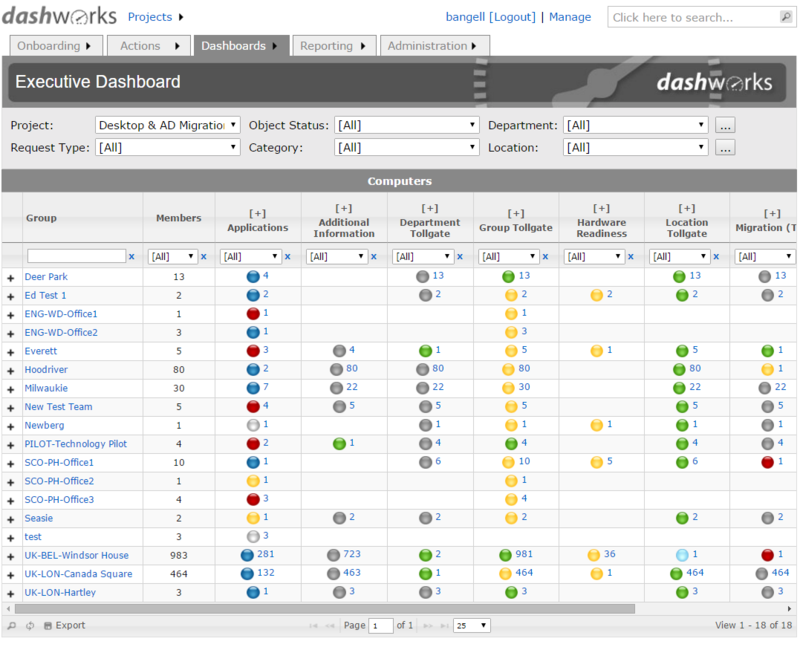 Feeds are established and data enters the Dashworks Analysis System. Immediately you can start to visualize the journey ahead and where to focus. In parallel to your data validation, your consultant is busy building your project framework. 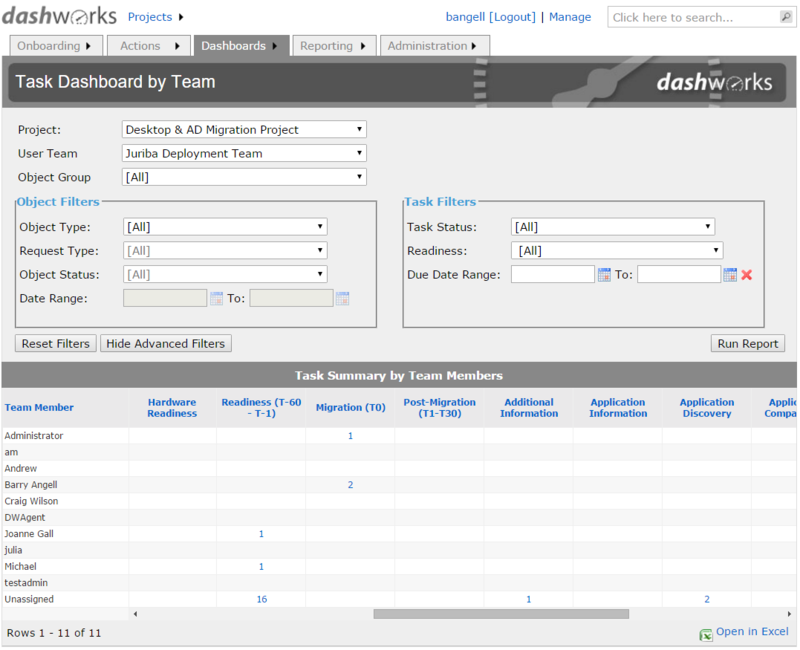 The Dashworks Project System template is populated so that you can test your end to end process manually. From here, tweaks can be applied to get your project readiness process as slick as possible, ready for migration velocity. The final step is to identify where manual, repetitive processes can be removed and automated. Deployment triggers to tools like the Microsoft Deployment Tool (MDT), SCCM, Active Directory, Dell Migration Manager, Binary Tree and Archive 360 can be established for accelerated IT migration project delivery. Want to read back migration success status? Not a problem. With your project purring like a well-oiled engine, you can now focus on making your superiors happy. Bespoke reports, dashboards and data extracts can be created to show progress, and published to those information consumers. Our consultants pride themselves on their collaborative approach to IT migration project delivery. Nothing pleases us more at Juriba than a complex IT migration delivered on-time and on budget. We believe that the best way to achieve this is to work hand in hand with your project team. By understanding and documenting your requirements, then translating them into Dashworks functionality, we can help to get your project started, built, and complete in the fastest way possible. Want something very specific? You only need to ask. With over 7 million asset migrations under our belts, Juriba consultants have been there, seen it, done it and bought the T-shirt. This experience comes with every Dashworks license sale, ensuring that you do not make the mistakes of the past. To keep you on track, your Juriba consultant will help and advise, while remaining open to innovative new ways of doing things. At Juriba, we understand that IT migration project setup is a stop, start process. You might need a few days to provision the Dashworks server, or establish a service account for our data feed. You don’t want a consultant to sit around, waiting for things to happen so that they can move forward. This is why we offer a unique resource draw down model. You can book our consultants in 3-hour slots, ensuring that you are using your project hours in the most efficient way possible. How many times have you employed a vendor only to question what they are doing while your budget drains away? Juriba implementation resourcing is different. By operating a pay as you go model, you only ever pay for what you use. Free, weekly reports then give you unparalleled insight into what has been done, who did it and how long it took. Consequently, you have unrivaled control your implementation costs, ensuring that work efforts remain focused and your budget is retained for value-add activities.